Tom Palmer and Lisa Henke return with new novel! Roy of the Rovers: Teamwork is out now! Yes, Melchester Rovers' brand new goalscoring superstar returns with another illustrated fiction adventure, from the bloomin' brilliant Tom Palmer and Lisa Henke. Roy of the Rovers: Teamwork picks up where Roy of the Rovers: Kick-Off left us - in the aftermath of Rovers' incredible cup tie against their superstar local rivals Tynecaster. New to the rebooted Roy of the Rovers? Catch up here! Find out more about Roy of the Rovers: Teamwork below, and head over to the shop to grab your copy! 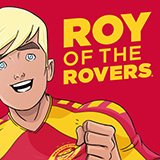 Don't forget to pre-order the next Roy of the Rovers graphic novel, Roy of the Rovers: Foul Play - out in March! Roy signs boot deal with Gola! You are now leaving the official Roy of the Rovers website. If you need to check with your parents before going ahead, do it now! And remember: never give any information about yourself or your family to any website you visit. Keep up to date with all things Roy of the Rovers on your tablet or phone! Read the comics, dive into the books, and grab some free comic strips – all in the new Roy of the Rovers app! Goals, glory and games galore await! Install now to read the free Roy of the Rovers strip that ran in Match of the Day magazine! Please provide your name. Please provide a valid email address. I confirm that I am 13 years of age or older.